Experience an array of talented music artists on a pleasant summer night at the Monday Night Live! concert series. The first annual series features a diverse line-up of folk, country and blues. The eclectic line-up of free live performances happen every night Monday night from June 10 – 24 at the Visitor Center, 201 South Main Street, from 7pm-9pm. Enjoy the fresh air, bring a chair and delight in the one-of-a-kind experience you’ll get from this unique outdoor music venue. 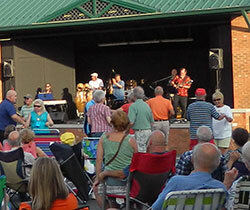 Bring a chair and sit back, relax and enjoy mountain heritage music and dancing from 7:00-9:00pm. Seating area opens after 5:30pm, early admission is prohibited. Please leave your pets comfortably at home, Hendersonville City ordinance prohibits animals in the event area. Admission is free. No alcoholic beverages, backpacks/tote bags or coolers allowed. In case of inclement weather the dance will be postponed until 8pm; if the weather does not cooperate by 8pm the performance will be cancelled. For additional information call the Henderson County Tourism Development Authority at 828-693-9708. The Monday Night Live concert series is coordinated, produced, and sponsored by Henderson County Tourism Development Authority.